Finally, the developers have started upgrading their software to let those software work in Microsoft’s Windows 8. And, like all other software reviewers, we, also have started reviewing each software that works well with Windows 8 OS. This time, we are upto Mipony Download Manager for Windows 8 that has been designed to automate the download files of host websites including Fileserve, Mediafire, Rapidhshare, Hotfiles, and the like. This Windows 8 download manager gives you a comfort while downloading files from the Internet. Yup…it takes care of just everything. Mipony automatically visits the website that is hosting the downloading file, waits for a required period of time, and get started with downloading lot of files, one-by-one, all automatically. Installing Mipony in Windows 8 is very much similar to how you download it in other Operating system. However, before I get down to its installation procedure, let me quickly summarize the main features of this Windows 8 download manager. 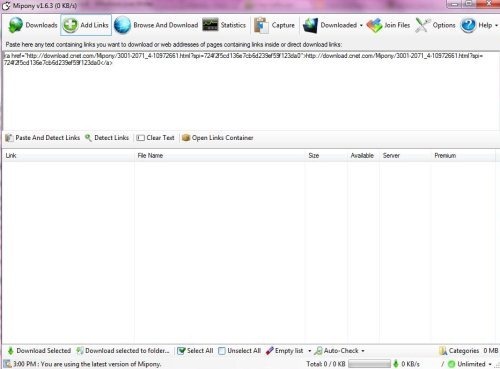 Goes to the downloading file hosting website and initiates download automatically. Checks each downloading link to see if it has been erased from the hosting site. Download multiple files simultaneously from each server. Works with free account and premium one of Megaupload and Rapidshare. Available for free to download. Also, check out Dropbox for Windows 8. Look for the file that you want to download, copy the text containing link. Once you are done, the program will soon detect the pasted link and will see the available servers. Now, in case the servers are available, it will create a check in green. Soon, it will start downloading the file. However, if you so not want to download the marked file, just unmark it. This will stop downloading. Yup..you will soon find all the selected links downloaded. Yup…you will soon find the download manager installed in your Windows 8 PC.